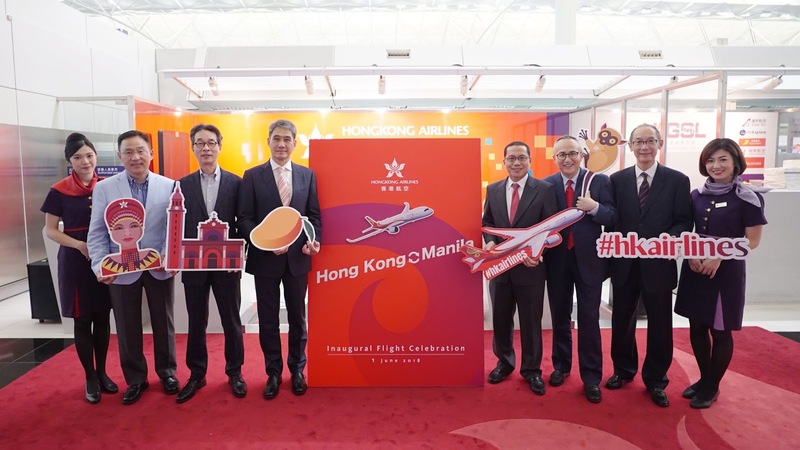 Hong Kong Airlines has celebrated the launch of its new direct service connecting Hong Kong with Manila. The daily service adds nearly 2,500 seats every week on this popular route, enabling the airline to meet the increasing travel demand from the Philippines and even destinations beyond its home base, including Los Angeles, San Francisco and Vancouver. To commemorate the launch of the new service, a celebratory event was held at Hong Kong International Airport on Friday, 1 June 2018. Hong Kong Airlines Vice Chairman Mr Tang King Shing officiated the ceremony, together with the Consul from The Philippine Consulate General in Hong Kong, Mr Paulo V. Seret and representative from the Airport Authority. Flight HX781 was welcomed by a traditional water cannon salute on arrival in Manila. The following day, a sending-off ceremony was held at Manila’s Ninoy Aquino International Airport Terminal 1 before flight HX782 departed for Hong Kong. The schedule for the new daily Hong Kong – Manila service can be seen below# (All times local). # Flight schedule is subject to change without prior notice.